The strategic vision that is essential for a company’s success in a new, unknown market can be difficult to fine tune. That vision must be built on a thorough comprehension of the challenges and potential inherent in the new environment. Successful strategic visionaries must recognize and accept that past methods and processes, while successful at the time, may not deliver the same results when applied to the new environment. 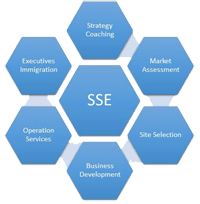 Sunshine State Enterprises is proud to help clients understand the strategic contexts awaiting them, such as market segmentation and the business value chain. By using specified milestones, our clients can save resources and time instead of spending them in failed efforts that are the results of a less structured strategy. The business plans that our team drafts help our clients on their routes to success, allowing them to maneuver through new processes and markets while directing their companies. These business plans can also be used by our clients in discussions with possible lenders, business partners, investors, and more. Marketing and communications is naturally a major factor when establishing a presence in the U.S. market, which may already be crowded with competitors. Straightforward translation of sales materials will not be sufficient for catching the attention of potential customers. Websites and social media outlets must be aligned for U.S. audiences and should be guided by a well-developed strategy. Attendance at national conferences and trade shows should also be considered as part of the process of introducing your value proposition. Sunshine State Enterprises’ expert marketing team will help you plan white papers, attention-grabbing press kits, product data sheets that are easy to understand, successful sales pitches, and other marketing materials all with a U.S.-based focus that can help you cross the cultural divide. Our extensive professional network can help a business take its first steps, which can be the most difficult and riskiest, to enter the U.S. market. With contacts in the company’s targeted geographical area, we help clients reach specific goals for their market entries. This network helps clients find the partners and allies that can be essential for sales generation. Partners in technology and licensees are just a few possibilities that can arise in the work of defining market opportunities and strategies. We also offer consultation on issues such as inbound lead generation, and we launch telephone and e-mail outbound sales campaigns. In addition, should clients desire, we can serve as their representative in the U.S. until the clients are prepared to launch their U.S. subsidiaries. Funding for entry into a new market can come from several different places. Some companies choose to use cash flow from their existing operations. Other companies decide to target market-local investors for funding, believing this will give them an edge from strategic relationships. Fundraising can require a great deal of time, however, even under ideal circumstances. When a company is managing from another location, however, the potential for distraction arises, and the company’s central functions can be impeded. Sunshine State Enterprises works with clients’ teams of management to create their companies’ value propositions, business plans, investment presentations, and related business documents. When Sunshine State Enterprises is interested in direct investments into a company, we syndicate and then present the opportunity to the fellow investors in our network. Local players can be invaluable for companies entering new markets, through cooperation between the two parties in ways such as investments, licenses, acquisitions, and joint ventures. Sunshine State Enterprises can assist clients with many of the highest-priority issues that are part of acquiring or merging with a company in the United States. Sunshine State Enterprises can help your US acquisition be a success. Sunshine State Enterprises manages an EB-5 fund (pooled) which will fund international business enterprises that are working to increase their sales (both in the U.S. and overseas). As we are in the process of development international business parks, which will be located in different parts of central Florida, we can share the successes and risks of clients’ companies. Our business parks include accommodations for several international enterprises that use advance technologies and that can contribute financial strength to the parks, the state, and the country.